Globally trusted exchange rates for your business. Choose a package that works for your business. Select the frequency of rate updates and number of API rate requests per month. XE’s Rate Blender uses over 100 global sources to reinforce accuracy. Plus, it dynamically detects and filters out any data errors. Easily plug-in XE Currency Data into your existing software. We provide SDKs for Java, NodeJS, PHP, and Python. Visit our Github and Swagger page for integration support, SDKs, & code generator. Customizable margins Use our margin parameter to add a % margin to our mid-market rate so that you can cover transaction costs such as credit card fees and more. Monthly averages The monthly average endpoint returns monthly average rates for a single base currency and one or more counter currency for the year you specify in your API query. Currency volatility Volatility measures the fluctuation in the exchange rate of a currency pair over a specific period, represented in a percentage. Ideal package configuration for accounting, ERP, CRM and in-house applications. Ample volume of rate requests for common business applications. Optimized package configuration for e-commerce, client facing applications and more. Ideal volume of rate requests for your multi-national client base. Excellent package configuration for enterprise applications, SaaS products, global e-commerce operations and more. Perfect volume of rate requests to power global applications. Empower your software, enterprise solutions, service platforms and more with XE Currency Data. When you can measure the real cost of foreign exchange, you can make better-informed business decisions. With planning, you can mitigate FX risks, reduce costs by choosing competitive providers, and develop global strategies to increase profits. Foreign Exchange is decentralized, so there’s no single market that dictates rates. 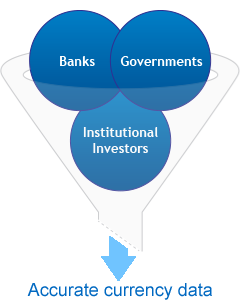 Instead, there are global financial centers made up of governments, banks, and other institutions. XE gets rates from 100+ international sources to ensure that our currency data reflects accurate global rates. Tracking multi-currency transactions can be complicated. You can reduce the risk of error and save time by integrating the API into your current software. Microsoft Dynamics, Oracle, Sage, Deltek, and SAP are just some of the platforms that our clients use. Expand your global customer base by displaying multi-currency pricing in your e-commerce platform. XE Currency Data can help remove barriers in the purchase cycle, cut sales funnel abandonment, optimize conversions, and improve sales. For more integration support check out our Swagger page . Here you can test drive our API with your free trial credentials and access Swagger’s client and server side SDK generator. Need help integrating your XE Currency API? If you need instructions on how to make API rate requests through your web browser, download the non-technical Quick Start Guide to help get you started. You can also download the Technical Specifications Document below. XE is the trusted rate provider for industry leading organizations around the world! Haven’t found what you’re looking for? Reach out to us here. We are happy to customize an API package to your organization's unique use case. Or if you are interested in partnering with XE, drop us a line. XE is always looking for new and interesting ideas on how to share our globally trusted currency data. At XE, we have a strong commitment to providing quality support.